The included hard shell travel case is one of the better ones I've seen supplied with a pair of headphones. It's got an ample amount of storage space for additional accessories within the case itself as well as on the outside. And the low profile design makes this case very compact for what it is. And as you can see, the QuietComfort 35 are capable of folding flat and into a more compact, easily carryable form factor just like the wired variant - the QuietComfort 25. It's great to see that no compromise has been made to achieve a wireless-going model. With the headphones included are a micro-USB to USB charging cable, an airline audio adapter, and a 2.5mm to 3.5mm audio cable for using the QC35 in a wired configuration. You don't buy a pair of Bose headphones for their styling, but I must admit that the new QuietComfort 35 are pretty good looking. The subdued, restrained design makes you want to wear them and puts the QC35 up there with some of the more popular models. We're pleased to see that Bose no longer makes headphones that only your dad would wear. A refined, modern design is important when it comes to a personal wearable gadget, but equally as important is of course functionality. An all-black or all-silver pair will set you back $350, which sound like a lot of scratch yet the QC35 are still less than what you'd pay for an equivalent alternative such as the Beats Studio Wireless, the Sennheiser Momentum 2.0 Wireless, or the Bang & Olufsen Beoplay H8. More and more companies are starting to give people what they really want – wireless headphones with active noise-cancellation. And Bose is one of these popular companies to jump on the wireless bandwagon. But so far Bose is the only one with the right formula for a formidable offering. The noise cancellation feature on the QuietComfort 35 is absolutely astonishing. It’s almost frighteningly at how effective it is. As soon as you slip these headphones over your head, they greatly reduce the ambient noise around you so well that you may think you’ve got deaf. These do quite a decent job at blocking out background noise passively, which is also a good thing when you run out of battery power and continue using the QuietComfort 35 in wired mode. But as soon as you turn them on, any fan noise, engine noise, A/C, washing machines, wind, irritating humming noises, road noise and so on – simply vanishes as if it was never there. I’m really astounded at just how good this noise cancelling technology is. 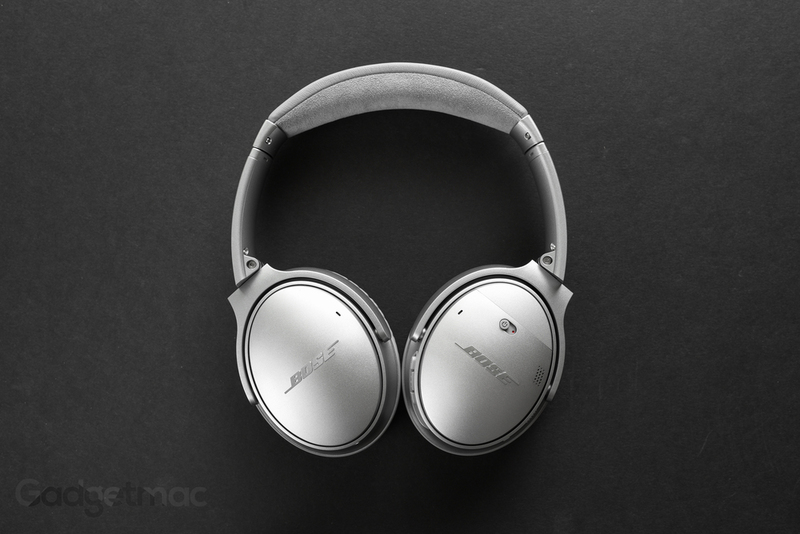 At this point and time, Bose is still the leader when it comes to active noise-cancelling headphones and nothing comes close to beating the QuietComfort 35 when looking for the best of the best in noise-cancellation. The noise-cancellation feature of the QC35 works so amazingly well that I have no trouble seeing people using these headphones just for that alone without even playing music through them in certain situations. You’ll still be able to hear people talking somewhat, but all other noise will be a nuisance to them and not you. And best of all, there is no hissing or static noise when not playing audio through the QC35. A common issue that’s typically prevalent in most powered noise-cancelling headphones, which is most apparent in headphones such as the Beats Studio Wireless and JBL Everest Elite 700. 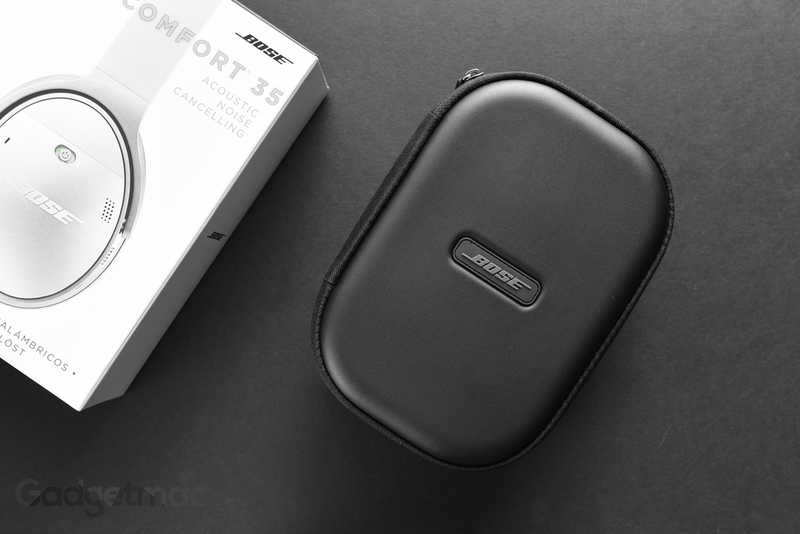 Although the QuietComfort 35 seem like they're made almost entirely out of plastic, which they essentially are apart from the beautifully finished aluminum side panels accenting both ear cups, Bose has used a special form of material that is supposedly more durable and lighter than ordinary plastic. A glass-reinforced nylon makes the majority of the headphones while a flexible spring steel reinforced the headband, which is lined with a suede-like material called Alcantara - the luxurious synthetic material found in the interiors of most performance cars. All in all the QC35 don't feel at all cheaply made and are quite sturdy for how lightweight they are. They make the Beats Studio Wireless seem inferior in many ways. I’ve worn some really comfortable over-ear headphones over the years, but I think it’s safe to say that Bose’s QuietComfort 35 are by far and away the most comfortable headphones I have ever recall wearing. These headphones have some of the deepest, most accommodating ear cup interiors of any over-the-ear headphone with the most cushiony, gooey-soft memory foam ear cushion padding. I've found myself wearing the QC35 for over two hours, continuously, without any discomfort whatsoever. I also love the left and right orientation detailing Bose embossed into the fabric covering the interior speaker drivers. To power on the headphones you'll need to switch on this little multi-function switch. It also doubles as a Bluetooth pairing switch. Conversely, you can tap your device up against the side of the QC35 to pair using NFC. You can also spot the QC35's myriad of on-board microphones, some are intended for the active noise reduction feature while others are designed to capture your voice for headset use. As for the QuietComfort 35's Bluetooth connection, it has been as solid as it can be. It's quick to pair and it'll remember multiple devices allowing you to simultaneously be paired with two devices at the same time. On the right side of the headphones you'll find three buttons that will let you adjust volume, skip tracks, play/pause, answer/end calls. These buttons offer great tactile feedback and make it easy for you to find the right button to press using your thumb. 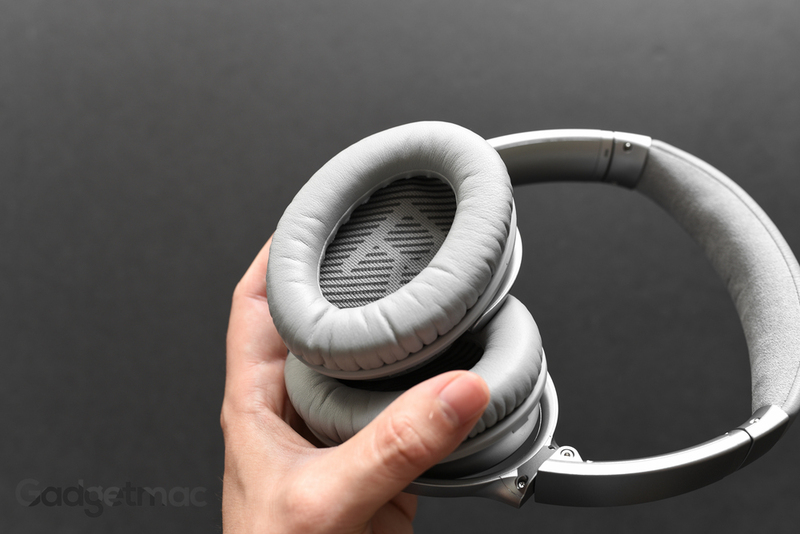 At the bottom is where you'll be plugging in the included charging cable to charge the headphones when the time comes, or if you need to connect the audio cable, you can also do so thanks to the 2.5mm audio input on the left side of the headphones. You'd be right to think that with all this powerful noise cancelling features that battery life would be poor, but on the contrary. In our testing we found that the QC35 lasted well beyond Bose's claims of 20 hours when used wirelessly. Amazingly, you can double the battery life and still have noise reduction enabled if you connect the headphones using the supplied audio cable rather than having them wirelessly connected over Bluetooth. The headphones will continue to function if you completely run out of battery in this mode as well. In other words battery life on the QC35 is excellent. And to check the battery percentage of the QC35 you can fire up the basic Bose Connect app or use the battery widget on iOS devices. There is also a battery indicator on the headphones themselves but it's really not as informative. The noise-reducing, dual-microphone system on the QC35 produce the clearest sounding audio quality I have ever experienced during calls. And when you are using these headphones as a headset, the microphones will actually play back your voice in real time through the headphones so that you can hear yourself better when talking. All of this magical noise cancelling technology doesn’t seem to have any ill affects on the actual sound quality, thankfully. So the QuietComfort 35 are capable of producing really clean, precise and natural sounding audio that’s appropriately balanced. Much like a German automobile, the QC35 are very controlled when it comes to highs, mids and bass. Nothing seems to shine or overpower the other, yet I feel like I’m hearing plenty of everything and it’s quite pleasing no matter what it is that I listen to. And not to make it like the these are some boring, flat-sounding wireless headphones because they really aren’t. In fact, the QC35 sound just about as good as the V-Moda Crossfade Wireless, albeit even clearer and just as vibrant. Bass is smooth and punchy, highs are crystal clear and the midrange sounds forward and very well defined. While the Crossfade Wireless will set you back $300 compared to the $350 you’ll need to drop for the QuietComfort 35, you are getting the best noise-cancelling in the game in addition to a much more comfortable experience. So should you spend the extra $50? It’s a no brainier. What I wasn’t very happy finding about the QC35 was that like Bose’s SoundSport Wireless in-ear headphones, they too were severely underpowered when it came to volume output. What this means to you is that in order to reach a normal listening level, you’ll need to turn up the volume past half. And while you can reach an arguably loud enough volume at around 75%, people who tend to set their volume higher than normal will find that the QC35 aren’t up to the task. You haven’t experience the true meaning of audio bliss until you’ve put on a pair of QuietComfort 35 headphones from Bose. This might sound like a quote from a Bose ad, and we think it should be because that’s absolutely true. If you’re looking for the best noise-cancelling wireless headphones on the market, grab yourself one of these headphones right away and you’ll be glad you did. All-day pressure-free comfort, excellent sound quality, unbelievably great active noise-cancellation technology, ridiculously long battery life and a solid build quality packed around a svelte portable design makes the Bose QuietComfort 35 one of our most favorite wireless over-ear headphones to date. And for that reason they easily deserve our Editors’ Choice Award.